After SIX months of renovating the 1950s ranch home, we bought last summer, the time has finally come to move in! 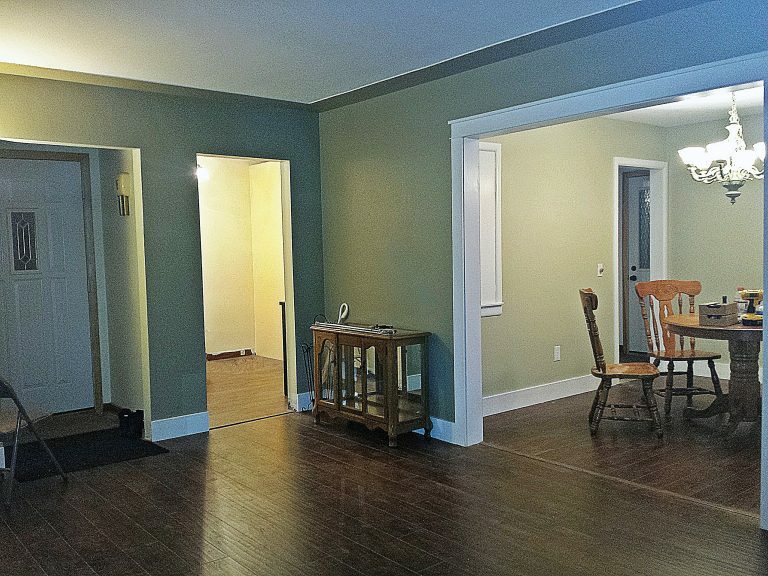 In honor of this long-awaited occasion, I thought I’d share some pictures of our finished renovation!! I use the word “finished” loosely because when you’re a designer designing your own home, you’re never really finished. 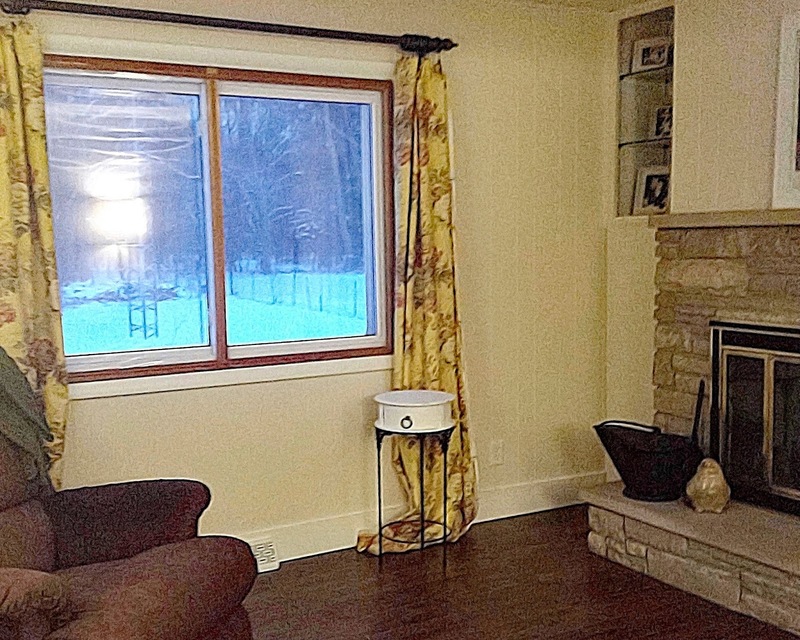 From the very first, I thought the family room was going to be my favorite room. I mean, what’s not to love with that cozy fireplace? It was hard to imagine that when we started out. It was very dark. 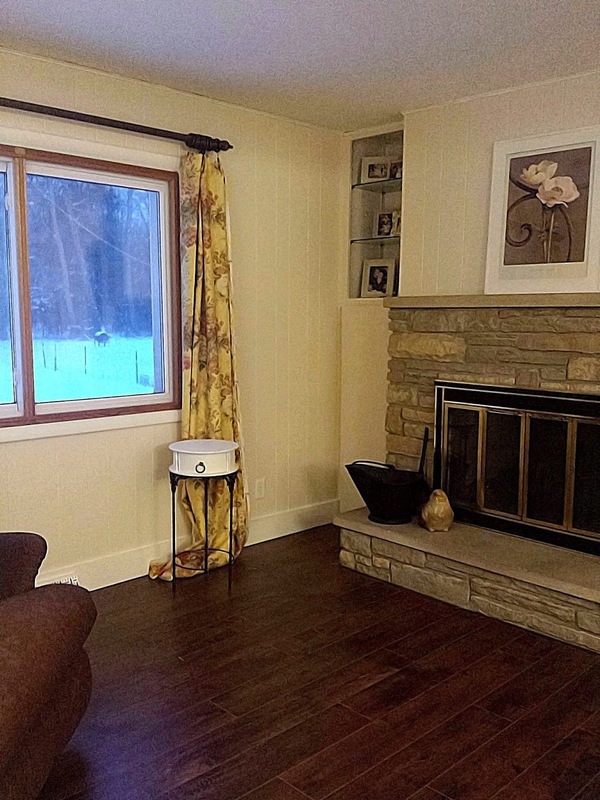 But with a coat of paint on the paneling and new flooring, it feels bright and airy. Checking the length of the curtains I’m making. They need to be hemmed. My beloved china cabinet in the dining room. 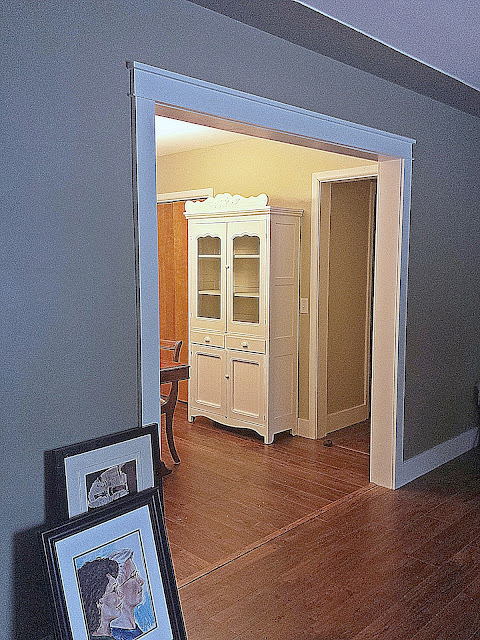 This is the view of the dining room from the front door. We’ve already moved in my beloved china cabinet. I was going to put it on the opposite wall, but I love that it’s the first thing you see when you come in the house no matter which door you come in. I’m so glad we removed that wall, because otherwise, looking this direction, you’d be looking at a wall instead of my beautiful china cabinet. Taking the wall out really opened everything up and made the whole house feel more friendly. 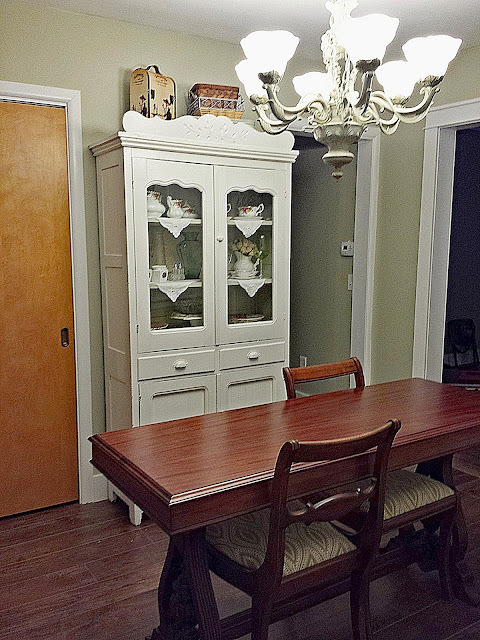 Right now, we have our antique library table sitting in the dining room. We did that so Jim wouldn’t bump his head on the low hanging chandelier. I can walk under the chandelier easily, but Jim is more than a foot taller than I am, so he would definitely hit his head if he wasn’t careful. The library table does give you an idea of how it’s going to look with our dining room table though because the two are very similar. Library table temporarily in the dining room. That library table was the first piece of furniture Jim and I ever bought together. We found it at an unofficial estate sale. We’ve bought several antiques since then, but this table is special, and we’ll never get rid of it. We have some dishes, and my rooster and cookbook holder found a place. Now we’re in the room that had the biggest changes! My custom kitchen!!! 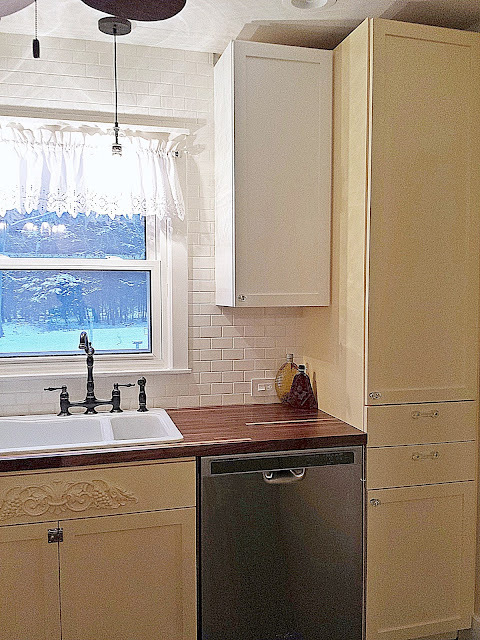 Once we installed the microwave, I realized I didn’t want doors on this upper cabinet. So we took them off, painted it, added wallpaper to the back, and I love it. Our cabinet maker notched out the frame for the door hinges, so I’m filling those in, but that’s an easy fix. If you look closely, you can see the pieces of wood I’ve put in to fill them in. I need to sand them down to match the size of the cabinet frame. After that, I’ll prime and paint them to blend in. If I do it right, you’ll never be able to tell the cabinet was notched. It’s really hard to pick a favorite thing in this kitchen. I just love everything. Now I just need to figure out where I’m going to put everything. I’ve never had so much storage space! Hey! What do you think of my rooster? 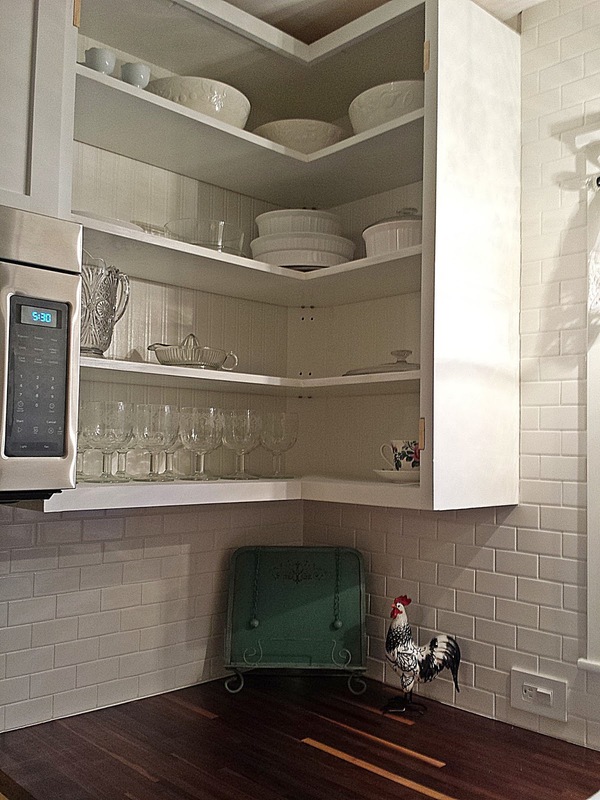 Did you know it’s considered lucky to have a rooster in your kitchen? We had to buy a new dishwasher. FYI, dishwasher pumps always have water in them, even when they’re brand new, so you cannot store them where they’ll freeze. If you do, the water will freeze and crack the pump. We found that out the hard way. Well, there’s the Sneak Peek! I’ll definitely have a lot more to show you once we’re all moved in. But I need to leave somethings as a surprise. I’ll be giving you a complete breakdown of each room, including before and after pictures, in separate posts. So much has changed, and I can’t wait to share it with you! 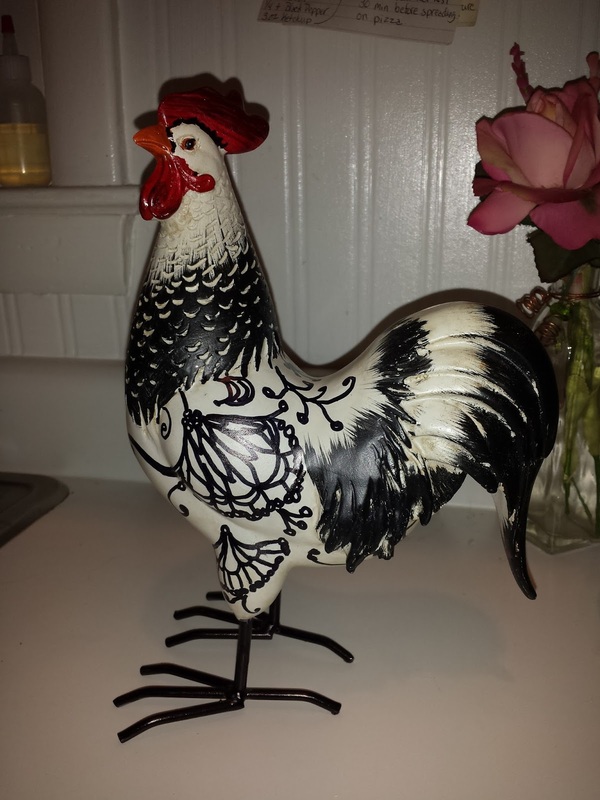 Seriously… Don’t you love my rooster?????? The wait is over! We bought a house!